Manhattan prosecutors have continued to pursue the seizure of antiquities in 2018. Yesterday the NYT reported that investigators seized several antiquities from Michael Steinhardt. Steinhardt has been the focus of much of the investigative thrust directed at the antiquities trade. Chasing Aphrodite thoroughly discussed Steinhardt in the recent seizure of a Bull’s head originating from Lebanon. Steinhardt is a noteworthy figure as he was an early pioneer in hedge funds, reportedly worth billions, who has also collected antiquities. One of the galleries in the Metropolitan Museum of Art in New York is named for him. He has also continued to acquire antiquities even as investigations and repatriations have continued in recent decades. The Manhattan district attorney, Cyrus R. Vance Jr. has done much to use his office to secure the return of looted antiquities. 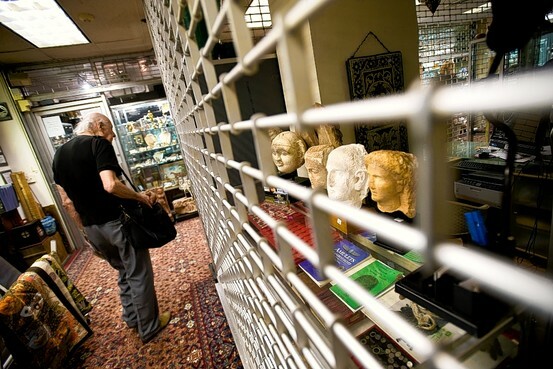 That trend looks to continue with the creation of a new Antiquities Trafficking Unit, led by assistant district attorney Matthew Bogdanos, a Marine who investigated the theft and looting of antiquities from Iraq during the U.S.-led invasion in the early 2000s. The investigation into these objects joins a long list of other investigations that the Manhattan DA’s office has successfully undertaken in 2017, including the return of a marble bull’s head to Lebanon which had been on loan to the Met, the return of an ancient limestone bas-relief on display at the European Fine Art Fair a the Park Avenue Armory, the return of a remnant from one of Caligula’s ships perhaps stolen from an Italian Museum before the Second World War, and other investigations. These investigations have resulted in the seizure of a great deal of material. Prosecutions of individuals remain elusive. Steinhardt has had very valuable antiquities seized from him before, yet he has continued to acquire this material. Whether this investigation will be able to change his behavior, and the behavior of others is an open question. The Manhattan DA’s office would not comment on the specific grounds for the seizures of these objects, other than the use of New York’s state theft statute. The NYT notes that though Steinhardt has had many object seized, he has not been the subject of any charges for possessing this allegedly stolen material. [A] Greek white-ground attic lekythos — or oil vessel — from the fifth century B.C., depicting a funeral scene with the figures of a woman and a youth, according to the search warrant. It is worth at least $380,000. Also seized were Proto-Corinthian figures from the seventh century B.C., depicting an owl and a duck, together worth about $250,000. The other pieces included an Apulian terra-cotta flask in the shape of an African head from the fourth century B.C. ; an Ionian sculpture of a ram’s head from the sixth century; and an attic aryballos, a vessel for oil or perfume, from the early fifth century. The objects were all bought in the last 12 years for a total cost of $1.1 million, according to the warrants. James C. McKinley Jr., Looted Antiques Seized From Billionaire’s Home, Prosecutors Say, The New York Times, January 5, 2018, https://www.nytimes.com/2018/01/05/nyregion/antiques-seized-from-billionaire-michael-steinhardt-cyrus-vance.html (last visited Jan 6, 2018). Art Traffickers Beware: The Manhattan DA Is Deploying a New Unit to Combat NYC’s Antiquities Crime Wave, (2017), https://news.artnet.com/art-world/manhattan-antiquities-traficking-unit-1182896 (last visited Jan 6, 2018). 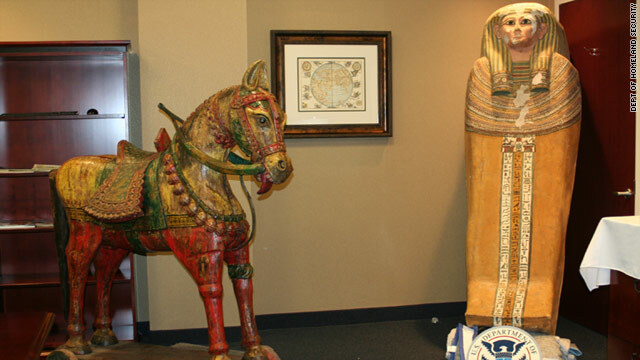 In a criminal complaint filed in New York State Court last December, charges were brought against a New York Gallery owner, Nancy Wiener for dealing in stolen property. When examining a complaint, special care should be taken that they are by nature one-sided accounts that are only allegations, in this case the allegations are made by Assistant District Attorney Matthew Bogdanos. Raynolds said that in its first four years in New York, large sheaths of granite came loose from the surface of Cleopatra’s Needle. An additional 780 pounds of stone were lost when a waterproofing company tried to stop the decay with a creosote and paraffin treatment in 1884. But the last major study of the monument, conducted by the Metropolitan Museum in 1983, found that the rate of decay had stabilized. The Parks Department says now there is no significant ongoing erosion on the obelisk. “And yet, you know there are still signs that there’s some gradual erosion occurring on the surface,” Raynolds said, adding that you can see patches of decay where the obelisk’s native pink color appears on the surface of the stone. [I]in May 1914, the Central Park commissioner with the help of Columbia University’s James Kemp and the Metropolitan Museum of Art’s William Kuckro began extensive restorative work on the obelisk during which they removed a paraffin layer, which was added soon after the obelisk’s erection, and they added a new waterproof coating. At this time the obelisk’s condition was described as “scaling on all sides,” and, “in some sections the shaft was blank for several feet.” The NYTimes’ description from 1914 appears to appropriately describe the damage, or deterioration, similar to that which is depicted in photographs on Hawass’s blog. So it certainly would not hurt to continue to study the conditions in New York, and the steps which can be taken to minimize damage, but my initial guess was correct. Zahi Hawass was making unfounded allegations to continue to press for the repatriation of objects. He may have a good claim for a number of objects, but that argument loses its steam when you make the same urgent calls for every object which originated in Egypt, irrespective of the circumstances surrounding its removal. Many of these individual objects carry unique circumstances, and all sides in these contentious arguments would be well-served to avoid premature or overly critical concerns. On January 4th, Zahi Hawass posted on his blog parts of a letter he sent to New York City May Bloomberg which was erected in Central Park in 1880. Hawass was not criticizing the installation of the monument, or the way in which Frederick Olmstead installed it in his grand park. Rather Hawass voiced some concerns about weathering being done to the hieroglyphic text on the needle. News of the fact that New York is not caring for an ancient Egyptian obelisk soon spread. David Gill argued “Noth Americans” who are critical of the situation at Pompeii should be “chastened”. But I’m not at all sure that weathering is actually taking place, and I do not see how Zahi Hawass can make that claim either: he has made his allegations on the basis of some photographs which he was sent. This is certainly outside my area of expertise, so I’d appreciate any corrections in the comments below. But it seems to me like Hawass is making some unfounded allegations. He is claiming that the air pollution, rain, snow and wind in New York are wearing down the obelisk. And from this image, some kind of weathering certainly seems to have happened. But why is the face to the right of the photographer still in very good condition? Moreover, in the comments on his blog, Hawass does not make any specific claims, or provide any possible remedies. He only makes a loud claim, that New York and Central Park are not caring for this object. 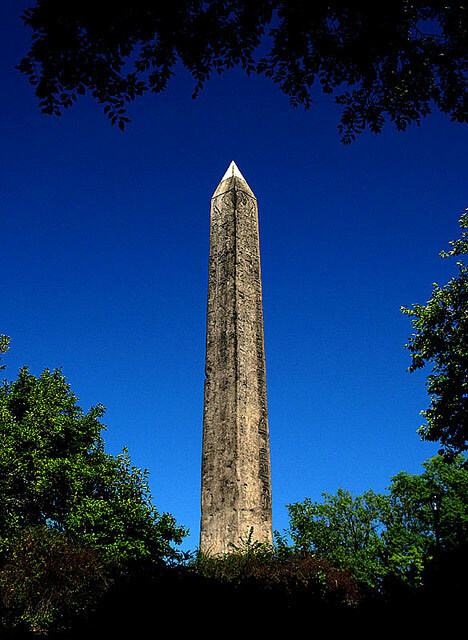 How do we know the obelisk did not look like this before it was removed to New York? No one can fault Hawass for his passion, but here I think his criticism of the care for this obelisk is misguided. Is there something toxic about New York that is prematurely weathering this obelisk? What about the similar obelisks in London and Paris? In another spoliation story in today’s NY Times, A grandson of a woman who died in the Holocaust may be considering legal or other claims for this work, Blooming Meadow (1906) by Gustav Klimt. Georges Jorish is considering legal claims or seeking a settlement. It seems the impetus for the new claims is the publication of another catalogue raisonné, this one by Alfred Weidinger which states the painting belonged to Jorisch’s grandmother. The work now belongs to Leonard Lauder, who purchased the work in 1983. Wouldn’t a legal claim have expired under the statute of limitations? Probably not. New York is one of the most generous jurisdictions in the world for original owners. A limitations period won’t begin to run in New York until a demand and refusal has been made. Other legal defenses may be available to Lauder if the claimant delayed, but here it seems Jorisch is considering a claim after new information. Fred Kaplan has a great article in Slate on the art overload one can experience by visiting the auction houses in New York before the big Spring auction season. I get a bit weak-kneed this time of year. It’s not the pollen or the anticipation of summer. It’s more like a mild case of Stendhal’s Syndrome, an affliction said to induce dizziness (and, in extreme forms, nausea and seizures) after unrelenting exposure to beautiful art. The disease got its name from the novelist, who suffered its effects during a trip to Florence in 1817. I get it in New York. Over the next few weeks, the New York branches of Sotheby’s and Christie’s will hold their spring auctions for Prints, then Impressionist and Modern Art, then Post-War and Contemporary Art—back to back, one after the other, after the other, after the other, after the other—and the sensory overload makes me swoon. But it’s not the auctions themselves that put me in this state (though they can be fun, too); it’s the preview exhibitions of the artworks up for sale. These showings are open to the public for several days before the auction, and they’re free of charge. Yet the majority of those who attend are art dealers or collectors. Most people I know go to museums fairly often and pay hefty admission fees for the privilege; almost none of them have ever been to an auction preview or have more than a vague notion that such things exist. It’s an interesting article, and one which only reinforces the idea that the auction market is flourishing right now. The NY Times’ Robin Pogrebin reported yesterday that the Metropolitan Museum of Art has declined to borrow a work by German Expressionist George Grosz. 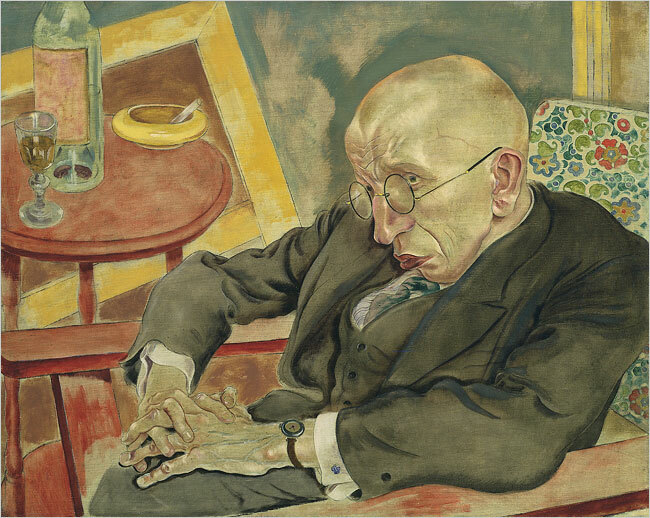 The work, “The Poet Max Hermann-Neisse” (1927) is the subject of yet another Nazi repatriation dispute. The Met has declined to exhibit the work, and substituted another, because the Grosz estate is contemplating a claim for restitution. The work belongs to the Museum of Modern Art (MoMA), and the Grosz estate has been in negotiations with them for three years. MoMA is one of the many museums which lists provenance information for its works on its website. The provenance for this work is here. The estate claims that the works had to be sold very quickly, and at a very low price because Grosz and his art dealer, Alfred Flechtheim, had to flee Germany because of Nazi persecution. Interestingly, only Flechtheim was Jewish. It was the nature of Grosz’s opinions and art which caused his flight. Initially, one might wonder how the Grosz estate could have a tenable claim all these years later. The work has been in MoMA’s possession since 1952. Apparently, Grosz saw the work exhibited there in 1958, shortly before his death. Statutes of limitations generally prevent claims from being brought after a period of time. They are based on the policy that as time passes, a fair adjudication of the issues becomes more difficult. New York courts have adopted the demand and refusal rule in interpreting statutes of limitations in the context of illicit art. The rule measures the accrual of a cause of action based on a plaintiff’s actions. To commence an action to recover property from a good faith purchaser, an original owner must prove that the current possessor refused to return the property after a demand by the claimant. See Menzel v. List 22 A.D.2d 647, 253 N.Y.S.2d 43 (1963). Thus it seems that the statute of limitations did not begin to run until 2003, when the Grosz estate first approached MoMA about the return of the work. Thus, in theory at least, they could still bring a restitution claim in time. However, the substance of that claim seems a bit difficult for the Grosz estate. The works were sold legally (Nicholas Katzenbach, a former attorney general, and an undersecretary of State for the LBJ administration investigated the claim for MoMA and recommended it be rejected), and MoMA would likely have a very good laches defense, which basically serves to protect defendants where a potential plaintiff has unnecessarily delayed bringing a legal action. Also, the value of these works may not be high enough to warrant a protracted legal dispute. A rough estimate I’ve seen thrown around is $3 million. If a work falls short of that standard, bringing a legal claim may not be financially feasible. This work has been estimated at $2 million in today’s market, but there is another work under dispute in MoMA’s collection as well. Of course, the Grosz estate may not be simply concerned with the financial implications of the suit. Why then did the Met refuse to exhibit the work? It may simply be a matter of not wanting to be associated with the bad publicity. The headline that they are exhibiting a work with a Nazi repatriation issue may have raised an issue that was more controversial than they were willing to take on. However, it seems like the dispute is getting more coverage because of the refusal. In any event, I do not know all of the facts , but the Grosz estate may have a very difficult time prevailing, considering the artist himself saw the work exhibited in 1958 and did not have any misgivings at that point.